Google Cardboard was the big surprise of this year’s Google I/O, and Google today announced that more than 500,000 of these extremely minimalist, phone-based virtual reality viewers have shipped since then. The early cardboard app was a lot of fun, but over the last few months, it felt like development had stalled a bit. Today, however, the company is launching an update to the cardboard app and new SDKs. It’s also showcasing some of the apps that developers have created over the last few months. These apps now also have their own dedicated collection page in Google Play and range from a Paul McCartney performance video to a 360-degree view of the Lord Of the Ring’s Shire movie set in New Zealand, with a couple of games and a Volvo-sponsored driving app thrown in for good measure. The open-source Cardboard viewer itself isn’t seeing any changes, but Google is introducing new SDKs for Android and the Unity game engine today that will make it even easier for developers to create new apps. The Android SDK handles everything from lens-distortion correction to head tracking and the rendering for developers who want to write their own OpenGL apps. Unity developers, on the other hand, can now install the Cardboard SDK and create their own VR project from scratch or adapt existing 3D apps for VR. The Unity SDK is also integrated with the Android SDK. All of this, Google’s product manager for Cardboard Andrew Nartker writes in today’s announcement, ensures that developers don’t have to worry about the technical details of getting their apps to work on Cardboard. For those who want to build their own Cardboard viewers (either privately or commercially), Google is also releasing a number of new specs today that were designed for specific cutting tools. One issue with custom viewers has always been that the Cardboard SDK didn’t allow you to provide the exact specs for your components. The SDK will soon feature a calibration tool that allows builders to fine-tune things like their viewer’s base and focal length so the app can automatically adjust to these different viewers. Google is clearly taking VR seriously. 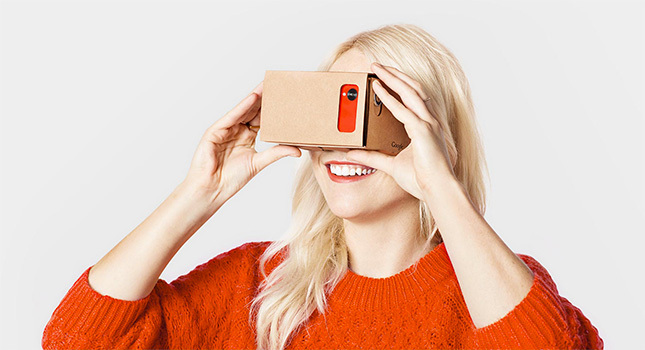 Cardboard is obviously just a first step and it’s no Oculus Rift. But the company is actively hiring developers for this project. Chances are, however, that many of them will also work on whatever Google is planning next in the virtual reality space. It’s clear, though, that what was once a 20 percent project is now becoming a 100 percent effort. Disclaimer: I co-wrote the text that goes with this Cardboard viewer.